In the production of complete modules or finished products, we use state-of-the-art assembly stations along with innovative technologies for the safe “packaging” of electronic modules. Electronic products and cable assemblies are combined to create the desired finished products. Potting of electronic devices in a “pot” (case or shell) with polyurethane or epoxy resin compounds has been used successfully for decades, providing excellent protection in harsh environments and difficult operating conditions. Thermal conductivity, moisture protection, mechanical resistance and excellent insulation make potted modules the ideal solution for the most extreme applications. Ultrasonic welding qualifies as the best suitable joining technology for plastic housings requiring mechanical protection against contact, good insulation and simple installation options. 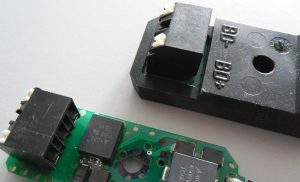 This solution provides tamper-proof protection of the electronic components. It is environmentally safe as no chemicals are used in the process. 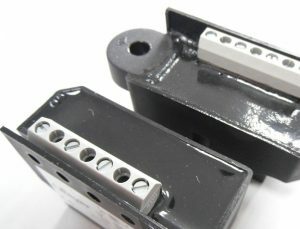 Standard plastic housings can be modified with an in-house milling machine to adapt them to the desired product. Modifications may include front panel cutouts, additional cooling slots or openings for contacts or installation requirements. Additional coating of electronic modules ensures enhanced moisture protection and better insulation. The coating material can be applied either directly to the components or to the housings in which they are placed. We preferably use UL-approved solderable conformal coatings manufactured by Peters. 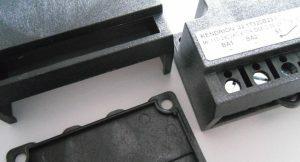 Polyamide-based hotmelt molding is a relatively gentle process for the protection of sensitive electronic components. Key benefits are fast and easy processing with or without additional housing or case, enhanced moisture protection and excellent insulation. While conventional two-component potting and encapsulation compounds have a comparatively high ecological impact, hotmelt molding materials are distinguished by their environmentally compatible processing capabilities. Functional testing equipment and measurement systems for electric safety compliance testing to VDE or EN 60204 requirements are used to test the finished products.